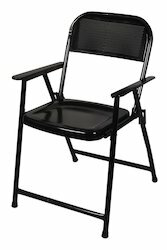 Pioneers in the industry, we offer metal folding chair, folding chair, fibre seat folding chair, fancy folding chair and mini fiber folding chair from India. Seating Height 1.5 - 2 Feet. 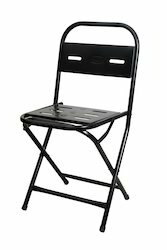 Accessible with us is an ideal quality Metal Folding Chair which is utilized as a part of numerous limited time occasions for sitting and numerous other open air places like patio nurseries, close swimming pools, ocean shorelines, parks and so forth. This chair is planned in such a way, to the point that makes it simple to crease and can utilize it anyplace. Because of its light weight it can be conveyed effortlessly and this seat is offered in wide range of hues to look over. In this domain, we have gained a reputed position for offering a wide assortment of Folding Chair. These folding chairs are manufactured at our well-equipped production unit by making use of supreme quality metals and innovative technologies. 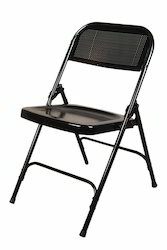 This folding chairs range is highly popular for its attributes like corrosion resistance, unique & mesmerizing designs and excellent finishing. 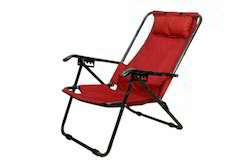 Folding chair offered by us is ideally used in homes and outdoor parks for comfortable sitting. We are instrumental in offering a premium quality Fancy Folding Chair that is offered in a plethora of designs, colors and shapes to meet the varied requirements of the clients. Offered folding chairs is designed and manufactured with the utilization of the superlative quality iron and modern technology at our ultra-modern manufacturing unit. 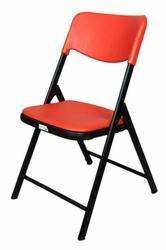 Prior to delivery from our end, this folding chair is stringently checked on the counts of strength, corrosion resistance nature and quality. 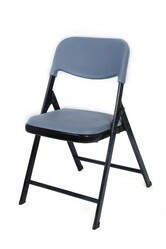 Moreover, this folding chair facilitates space saving sitting solution. Looking for Folding Chairs ?